This Monday (Apr. 11th,2011), the Council will have the first of two hearings on the Charterwood development. This proposed development supposedly aligns with the goals set forth in both the Town’s aged Comprehensive Plan and the problematic Northern Area Plan. I’ve read well over a hundred of planning proposals the last decade and have seen a steady trend of “cut-n-pasting” language from other successfully approved proposals to justify a new project – usually generic snippets from the Comprehensive Plan characterizing some community benefit (“well being”) which is hard to objectively pin down. Certain catch-phrases become de riguer as time goes on: “transit-oriented”, “green”,”sustainable”, etc. Each used to suggest qualities the project might or might not have but each having been successful in pushing other projects through the pipeline. Because of that applications usually have a strange quirk, some strangled logic, used to justify a quality the project doesn’t innately possess. For instance, the developers of Charterwood are seeking a “mix use village” (MUV) zone and claim their project, which calls for clearing acres of 100-year growth forest to make way for 282 parking spots, is “transit-oriented”. As Del Snow, a tireless advocate for northern Chapel Hill (who I’ve served with on several advisory boards), points out in today’s Chapel Hill News, the price of this project should be carefully weighed against all the costs it incurs. As proposed, Charterwood barely meets the criteria laid out in the Northern Area plan. This is not a compact, dense development which seeks to maximize a tracts potential while minimizing its impact on local neighborhoods, current infrastructure and environment. One example: the “transit-oriented” layout calls for carving an acre of impervious surface parking lot out of the existing tract of 100-year growth trees – a tract which sits at the headwaters of several local creeks. Another: the potential environmental risk posed by shifting the responsibility for maintaining the current on-site catch-basins in this sensitive area from NC-DOT to a private commercial entity. Land available for development is dwindling in Chapel Hill. As a result, we will be seeing more and more applications from developers that stretch the limits of our ordinances and ask us to re-assess our priorities. Council will have to decide if the public good is best served by foregoing the principles laid in our current planning framework or by sticking with those community priorities which balance the public price against private reward. 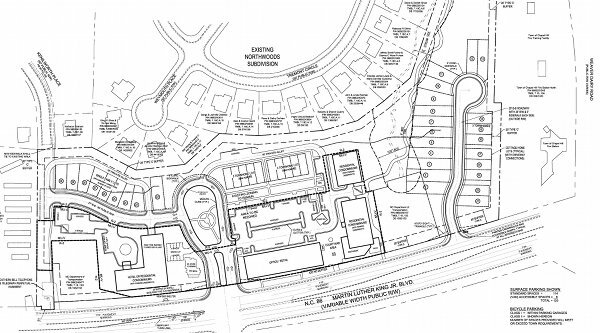 More on Charterwood’s zoning application, design goals and anticipated footprint. Though the day was grey, this morning’s formal commemoration of the end of the current phase of Baldwin Park’s stream restoration project was well attended by local pols: Carrboro Alderman Randee Haven-O’Donnel, Lydia Lavelle, Sammy Slade, Chapel Hill’s Mayor Mark Kleinschmidt and Council member Donna Bell (who lives a few steps away from the park) joined Town staff and a small group of local supporters in recognizing the revamp of this stretch of stream. Mr. Baldwin, whose uncle Henry Baldwin owned the property (and mortgaged his house to help build St. Joes), told of walking across this stretch of land as a boy in a straw hat when it was still relatively wild before thanking the community for the improvements. Local environmentalist and incredible photographer Mary Sonis has made a stunning discovery in her backyard. Below is a rare 4 toed salamander, “a species of special concern in North Carolina” (to quote her excited announcement). Mary contacted an expert at the North Carolina Museum of Life and Sciences who said he had never seen one of these in the wild. 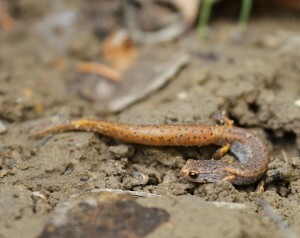 These salamanders breed in bogs and seepages. In this case, a seepage from a vernal pond within the Bolin Creek forest. Some readers might recall the recent two year long lively debate over paving tracts of Bolin Creek within Carrboro’s jurisdiction for a greenway. Several of the proposed routes targeted for obliteration the very vernal ponds and seepages making up the habitat of this exceedingly rare species. Now that Mary has confirmed that these salamanders inhabit Bolin Creek’s watershed, it is incumbent on our local leaders to adopt those proposed routes which maintain the integrity of the stream and vernal pools that are critical components of this and other “critters” habitat. Our community spends a lot of time talking “green”. We’ve encouraged developers and policy makers alike to commit, with some success, to an environmentally sustainable future. Most of the effort has been put into conserving energy, lowering the impact of development, preserving green-space and securing open-space. “Think green” has moved, in fits and starts, from an empty mantra to being a more integral part of the development discussion. Unfortunately, the time isn’t always taken to tease out what is truly “green” and to what amounts to “green washing” in evaluating various development proposals. Sometimes the natural alignment between environmental justice and social justice is split. Some environmental concerns continue to be ignored. For one, shepherding our limited natural water resources and adopting policies that constrain growth to live within those limits continues to get short shrift. Chapel Hill’s Council recently reversed a policy of not tapping Lake Jordan for anything other than a catastrophic water crisis. In weakening the resolve earlier bodies showed, they opened the door to growth fueled by external resources. Our community has steadfastly supported land-use policies that try to maintain the high quality water drawn from the local watersheds. We have been told that our investment in those resources would maintain a reasonable level of growth for the next 100 years. Apparently the community’s resolve is firmer than our current Council’s. Water is becoming the dominant limiting factor to growth for community’s all across the globe. Even in areas blessed with plentiful rainfall, maintaining safe and reliable access to water is a problem that only grows with time. As North Carolina continues to dip in and our of drought, we need to recommit to the vision of living within the watersheds OWASA has acquired on our behalf. Along those lines, we need to think more than “green” in making decisions about how Chapel Hill and Carrboro evolve over the next few decades, we need to start thinking “blue”. 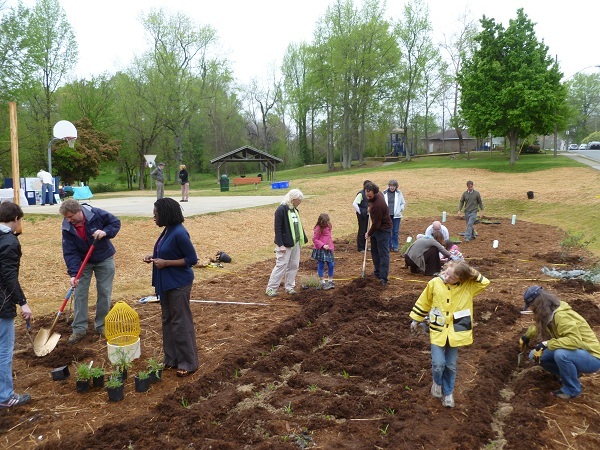 That is why I’m thrilled by the efforts of the Friends of Bolin Creek [FOBC] partnering with Chapel Hill and Carrboro in putting together an Earth Action Day which emphasizes WATER. Starting off at 9:30am, a dedication will be held for the Baldwin Creek Restoration project [MAP]. Chapel Hill, Carrboro and the Friends of Bolin Creek partnered on this EPA 319 grant project to start reversing some of the damage caused by previous poor management practices. Project lead Trish D’Arconte has worked hard to make “think blue” a reflexive part of Chapel Hill’s policies and will be explaining how the work at Baldwin Park is a start on a larger effort to remediate many of the impaired streams in our community. From 10am-12pm April 9th, 2011, the FoBC’s Creek Action Tour has 9 separate events (INFO) and demonstrations reflecting on improving our local impaired watersheds through conservation, sound management and awareness. 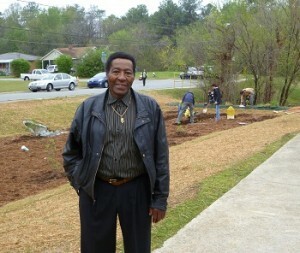 You can learn how to make changes at your own home, in your own neighborhood, that will improve the streams in your area. The FoBC is also holding a raffle with several great prizes, including a personal tutorial on constructing a rain garden. Chapel Hill’s Wes Tilghman (who I worked with on planning 2010’s Festifall) and staff put together an event that celebrates and highlights our community’s environmental commitment. From 12-5pm (INFO) a wide range of entertainments and exhibits will be shown at Southern Community Park. Free shuttles are available (check the website for more information). Trash Talk: The Neverending Story…Ends? [UPDATE:] WCHL’s Elizabeth Friend has a great summation here. Over a decade ago, just as I was beginning to get involved in local issues, I heard then local NAACP President Fred Black and Roger Road resident Rev. Robert Campbell brief Council on the fairly extensive list of negative impacts our landfill was having on the Rogers Road neighborhood: rats, buzzards, landfill leachate spilling across lawns, tainted water, debilitating odors, broken sewers, dangerous roads, among others, plaguing the area for decades. They referenced a 1972 unrecorded pledge (since disputed by local governments) by then Chapel Hill Mayor Howard Lee that the small community would get new services for taking on, at the time, Chapel Hill’s garbage burden. Further, they stated Lee claimed the landfill would only operate 10 years (1982) and that he promised obvious negative impacts would be mitigated over the whole lifespan of the project. As of early 2000, after several extensions of the landfill’s lifespan, the small Rogers Road community still waited on those new services, necessary remediation and a time-certain for closure. Fred and Robert made a convincing case that given the dearth of leadership from the County that Chapel Hill should lead the way in finally addressing these issues. The Council wrung their hands but did little more than pass the buck back to Orange County claiming impotence in discharging that long held obligation. The struggle to get some kind of reckoning has been long. Its been tough. There have been setbacks ( background). Tonight, though, with unanimity the current Orange County Board of Commissioners vowed to finally make good on that 40 year old debt. What started out as a discussion of a proposal to extend the landfill’s life, again (through 2017), became a solid consensus to delay any further action contingent on the formulation of a firm, specific plan of remedying the Rogers Road community’s problems. It started out with more than a dozen folks, including Rev. Campbell, standing before the Commissioners highlighting environmental problems like air and water pollution, describing the 42 illegal waste dumps surrounding the landfill, reporting on the 2+ tons of litter recently removed by volunteers from the nearby roadsides. I focused on the process. Why, I asked, hadn’t the County included a specific mitigation plan in tonight’s proposal? A call Commissioner Valerie Foushee echoed minutes later. Where would the funds come from given the County hadn’t been setting aside funds as per the 1997 landfill extension agreement? Why hadn’t, given the breathing room last year’s decision to ship waste to Durham’s trash transfer facility, the Solid Waste Advisory Board (SWAB) taken on the task of capping of the landfill in a socially responsible fashion? What would the Rogers Road community get from yet another extension of their problems? As I put it – irrespective of whatever promises made or not by Chapel Hill Mayor Lee in 1972, the County and the Commissioners now owned the problem. The Commissioners, after taking in these comments, each took a turn explaining why they couldn’t endorse an extension that didn’t include a specific plan of action for mitigating the decades of harm caused by the landfill. Relatively new County Manager Frank Clifton said as someone who hadn’t been involved in all the discussions, hadn’t heard decades of problems, as an outsider, he was mystified that the County Commissioners hadn’t taken advantage of the 1997 stipulations to fund mitigation. He said he and his staff had long been ready to take all the studies, advisory board reports, commission results, etc. and formulate a plan of action. He also said – clearly – that this had to be a County staff driven effort and that the County’s partners – Chapel Hill and Carrboro – would be advised but not counted on in moving forward (the municipalities have been missing in action for decades though the Council finally did appoint Jim Ward as liaison to the SWAB). Brief summary: the BOCC accepts full responsibility for what should be an obligation borne by all the local leadership. They have instructed staff to create a specific plan of action and to seek funding for it. That plan will identify mitigation strategies the County can legally carry out. The municipalities will be advised but not relied upon (a sorry comment on current affairs) in moving forward. Quiet elation – a strange feeling – and a reasonable outcome after a long, long haul. More than ten year’s in the making the final chapter, hopefully, is being written on the Rogers Road landfill story. Looks like the rumors I’ve been hearing for the last few months are true, the much touted Greenbridge project is in deep financial trouble. The high-density development (which has saved Downtown according to the local Chamber of Commerce director Aaron Nelson) hasn’t been able to sell units and pay its construction bills according to today’s N&O. Most of the “successful” sales have been the moderately priced affordable units. Those are the same units Mayor Pro Tem Jim Ward wanted a report from staff on to verify that they were serving the broader community instead of housing well connected community members or graduate students. Most of the current sitting Council enthusiastically endorsed Greenbridge, creating a new Downtown zoning district and then granting variances on density and height above and beyond the new zones limits, because they bought into this new model of development. With the Town’s similar joint project with RAM Development (West140) just underway, now would be a good time to reflect on the lessons that can be learned from Greenbridge’s difficulties. Google has chosen Kansas City, Kansas as their partner in deploying 1 gigabyte/second network services to the community. Chapel Hill applied with some gusto several years ago for the “honor”. At the time I argued that while it would be nice to have the financial backing of Google, Google’s reticence in discussing privacy, security and local control made a possible deal problematic. The Town continues to limp along with its joint fiber optic deployment project with NC-DOT. What is missing, still, is any real effort by the Council to form a community-based advisory group for leveraging that public investment in high speed networking to attract economic development or increase access throughout our Town’s neighborhoods. Maybe with Google off-the-table we will finally put the attention into the fiber project I called for over 9 years ago when I started pushing for municipal broadband. I’ve been thinking about my Libyan friend Ish’s family the last couple weeks. Finally, a promise of freedom from oppression but at a steep price. As the daily death toll mounts in the Libyan countryside I can only hope that they come through unscathed. [UPDATE] WCHL’s newest reporter Freda Kahen-Kashi has the story – Mayor Mark Chilton Finds Faults With OWASA Plan. [UPDATE 2] Further information on the meeting from the Daily Tar Heel. Continuing, the DTH says Merklein said the water might be needed sooner than expected. “Recent droughts have emphasized the need for a diverse water supply as we face increasingly uncertain future conditions of climate, land use and hydrology,” he said. If this is an accurate quote then we should be concerned. Chapel Hill’s Sustainability Visioning Task Force probed OWASA on this point repeatedly last year. They were told that the Long Range Water Plan, which relies on the local watershed, had sufficient resources allocated for non-emergency use without tapping Lake Jordan for the next 50 years. Chapel Hill’s Town Council was told the same thing several times, last year when OWASA presented the Long Range Plan and as recently as last week. Gordon is right highlighting the uncertainty in land use policy. Until Chapel Hill adopts policies which specifically tie resource constraints to growth, OWASA and other local agencies will have difficulty planning for the future. Our community has invested heavily in acquiring and maintaining a watershed that was projected to suit our needs far longer than 50 years. With the recent flurry of statements coming from OWASA’s Board to the contrary, do we need to re-evaluate that previous assertion? Like I said last night, what has changed so dramatically? Or, rather than bungled projections, is this a case of wanting to accommodate a much higher growth rate than local resources will ever sustain? Following up on yesterday’s post (Water, Water, Everywhere…), I just heard that Carrboro’s Board of Alderman have decided not to approve OWASA’s proposed amendments. I don’t have anymore detail at the moment so I’m not quite sure if they agreed with all the points I outlined or had a few additional ones I didn’t pursue. In any case, maybe Council will now take time to review the provisions and reconsider last night’s vote. Spent a tad more than 5 hours discussing zoning and zoning related issues today. Got a quick refresher on ArcGIS and then got some excellent practical advice on how to work with our local GIS (geographical information) to tease out socio-economic trends within our community. The technical know-how of the UNC students is impressive, the commitment to rethink cartography’s role in shaping our world view even moreso. Maps, as one of the CCC members noted, are presented as fact. We habitually consume their content without due consideration, assuming the scientific trappings they come bundled with convey a solid certainty. But maps can lie. They are often stripped of social context and employed to force a particular narrative. The CCC is interested in expanding the capabilities of maps – integrating a wider community-based context – exposing a richer variety of stories within our community. After the work session, I sped off to the Southern Human Services building for a review of the County’s Unified Development Ordinance (UDO).